Now that November is here, I’m so ready to start planning a fabulous Thanksgiving meal with my sister-in-law. Not only do I love a delicious meal, but I love a pretty place setting too. A couple of weeks ago, I fell in love with Mandi’s Simple Grapevine Wreath when it appeared as part of the 101 Days of Christmas series. Simple, yet beautiful. The grapevine of the wreath reminded me of some brown “vine” wire that I picked up at the craft store awhile ago. I was inspired to replicate the wreath’s look in the form of a napkin ring. These braided vine napkin rings will add a pretty touch to your Thanksgiving Table! For a thin napkin ring: Cut three lengths of brown “vine” wire (mine were about 8″ long) with the wire cutters. Use hot glue to secure the ends on one side together, then place the glued end inside a binder clip to help stabilize it while you loosely braid the vine wire. As you’re braiding, bend the wire as necessary to get the look how you want. For a thicker napkin ring: Cut an odd number of pieces of wire. (For this sample, I used 5 pieces.) Secure with hot glue and the binder clip as described for the regular 3-strand braid. Take the wire from the far right and move it to the center position. Then, take the wire on the far left and move it to the center position. Continue braiding in this fashion until you’ve braided the entire length. 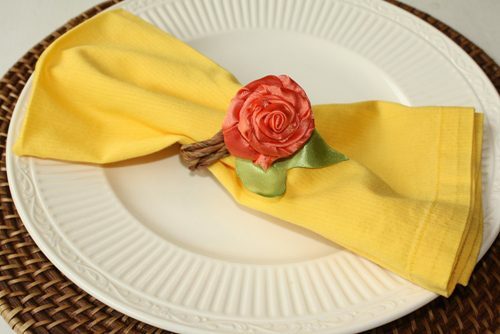 Glue your fabric flowers and leaves onto the napkin ring. I used orange glitter costume satin to make these rolled fabric flowers. Because costume satin frays easily, I made sure that the cut edge of the fabric was rolled and glued down to give the flower a more “finished” look. For the fabric leaves, I followed the instructions from my satin flower tutorial. Looking for other ways to set a pretty table? What do you to make your Thanksgiving table pretty?